Seven Hundred Million Sources. Four Hundred Disks. It was the curly-haired Dr. David Leisawitz who first told me about the WISE mission. I remember sitting in his office in front of a giant black-green-magenta sky map while he described how the WISE mission would find amazing kinds of disks: disks hosting young planetary systems, disks in old planetary systems, all kinds of exotic phenomena. He told me how the science team was combing through the data right now by computer to find these disks. But every source had to be verified by eye. I left David’s office inspired, and eager to find new ways to use the vast database from the WISE mission. So I called on Dr. John Debes, an expert in white dwarfs, a kind of old, dead star. He started digging through the WISE data, finding disks around these white dwarfs—ghosts of dead planetary systems. It was a different kind of search. But again, every source had to be verified by eye. I started wondering: is it possible that folks are going about this backwards? What if we could check through the whole WISE catalog by eye, right off the bat? What would we find then? But I still wasn’t confident in the idea. So I called up Drs. Debbie Padgett and Luisa Rebull, who were also leading large efforts to find disks with WISE. Debbie discovered a spectacular example of a debris disk that in Hubble images resembled a giant skinny V, probably sculpted by a hidden planet. Luisa had been scouring star-forming regions, finding protoplanetary disks. And once again, in both Luisa’s and Debbie’s WISE searches, every source had to be verified by eye. The next step was obvious; we wrote the Zooniverse folks and began working on a site. Fast forward through a few years of planning. Now David, John, Debbie and Luisa and I have joined with Dr. Mike McElwain and other experts to become the Disk Detective science team. A few more months of site development and here we are on launch day, ready to work with you, ready to find some disks that nobody else will spot–thanks to your eyes. So let me take this chance to say that we can’t wait to meet you. I hope you are patient and determined, because it won’t be easy. But I think the chance to discover a new disk—a whole nascent planetary system—in one shot like this is worth the effort. 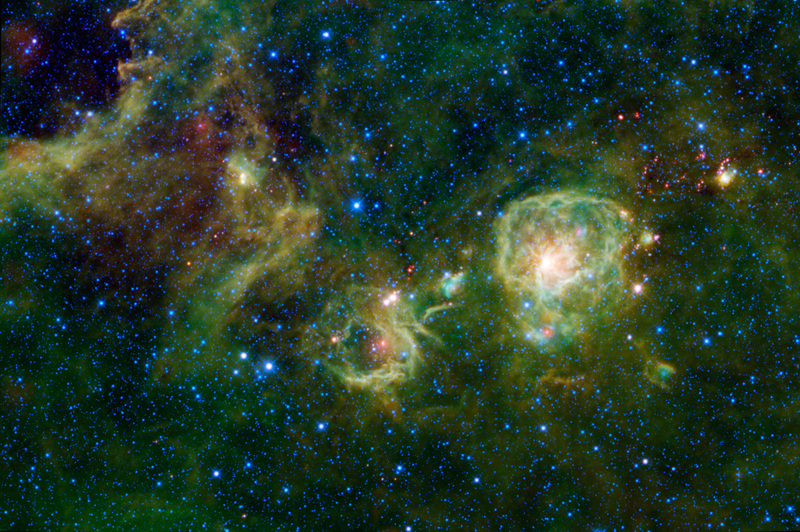 And who knows what else we will find lurking in the spectacular WISE database, the deepest all-sky infrared survey every undertaken? Thank you for joining us at Disk Detective. Good luck, and remember that the world is full of obvious things that no one ever observes.